What is the calf moose survival rate after cow is killed? Moose calf survival rate is low in it's first year depending many factors, such as predation, hunting, harsh weather, etc. Moose calves may have as low as 10% chance to make it through it's first year of life. Conversely, calves that are born in areas free of hunting and predators may have a survival rate approaching 70% in their first year. This is with having a mother moose to take care of a calf. Without a damn for protection, a calves chance of survival is near zero. 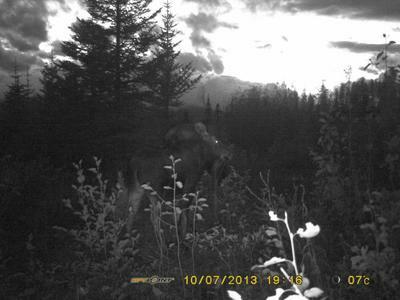 There has not been extensive study of moose calf mortality; in areas where biased aerial surveys have been completed the data is subject to large errors. Mortality is highest in the moose calves first 8 weeks of life, primarily because of predators. Survival of moose calves in it's first year is broken into two groups: 0 - 6 months and 6 - 12 months of age. The older the calf the greater chance for survival. A calf moose that is 1 1/2 years of age (young adult) has a much greater chance of survival if its damn has been killed. During the fall mating season a calf that is 1 1/2 years of age is chased away and left to find its own umwelt.